McKinsey 7-S Framework was the outcome of much earlier work, but was crystalized by Bob Waterman and Tom Peters in the 1980s, when they were both McKinsey consultants. An enduringly useful tool for anyone developing organizational strategy, it superseded a preoccupation with structure as the be-all-and-end-all of strategy. I suggest that you take a look at what McKinsey has to say all these years later, for as they say, “When introduced in the late 1970s, the 7-S framework was a watershed in thinking about organizational effectiveness.”. 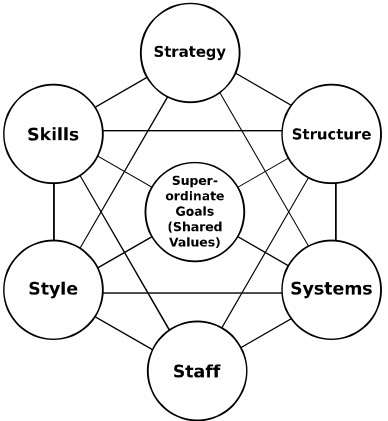 ‘Superordinate goals’ was the original core of the McKinsey 7-S Framework, but quickly became renamed ‘shared values’ and I believe this is critical, especially in today’s world. Those two words encapsulate defining what the venture is all about. Think very carefully about shared values and make sure that they are not simply platitudes. You need to monitor how those shared values are actually practiced in reality. Use of the McKinsey 7-S Framework involves a process of ensure that all components are coherent. Any one of the seven ‘Ss’ could easily derail the strategy if it was at variance with the others. My MBA course on sustainable strategy used Richard Rumelt’s book, Good Strategy, Bad Strategy1, as a set book. I recommend it to you, too. Great though I consider the McKinsey 7-S Framework, there are other models you might consider before you set to work on strategy; a favorite of mine is the Timmons Model of New Venture Creation, since it does focus on startup, rather than all organizations. There are several other Helpful Tools on the Venture Founders website that you’ll find useful.